Down syndrome is the most frequent genetic disorder in humans. Rare cases involving partial trisomy of chromosome 21 allowed a small chromosomal region common to all carriers, called Down Syndrome Critical Region (DSCR), to be determined. The DSCR1 gene was identified in this region and is expressed preferentially in the brain, heart and skeletal muscle. Recent studies have shown that DSCR1 belongs to a family of proteins that binds and inhibits calcineurin, a serine-threonine phosphatase. The work reported on herein consisted of a study of the subcellular location of DSCR1 and DSCR1-mutated forms by fusion with a green fluorescent protein, using various cell lines, including human. The protein's location was preferentially nuclear, independently of the isoform, cell line and insertion in the GFP's N- or C-terminal. A segment in the C-terminal, which is important in the location of the protein, was identified by deletion. On the other hand, site-directed mutational analyses have indicated the involvement of some serine and threonine residues in this event. In this paper, we discuss the identification of amino acids which can be important for subcellular location of DSCR1. The involvement of residues that are prone to phosphorylation suggests that the location and function of DSCR1 may be regulated by kinases and/or phosphatases. Down syndrome (DS) is the genetic disease most frequently afflicting humans and is detected at a ratio of one out of every seven hundred births . Although most of those affected have an extra copy of chromosome 21, a few more rare cases involving partial trisomy define a region common to all carriers of the syndrome, called Down Syndrome Critical Region (DSCR), which is purportedly involved with the carriers' anomalous phenotype [2, 3]. A gene located in this region, approximately 2 Mb above D21S55, has been dubbed DSCR1 – Down Syndrome Candidate Region 1 . The genomic sequence of DSCR1 totals 45 kb, including 7 exons and 6 introns, and analyses of different cDNAs have found that the first four exons are alternative and code for two isoforms of 197 amino acids and one isoform of 171 amino acids, which differ in the N-terminal, the last 168 residues being common . Recent studies have indicated the presence of an alternative promoter region with approximately 900 bp, between exons 3 and 4, suggesting that the fourth isoform may derive from an alternative promoter . Analyses by Northern blot have detected high levels of transcripts in brain, striated skeletal and cardiac muscles, placenta and kidney [4, 5, 7–9]. Through the analysis of amino acid sequences, a high identity has been found between DSCR1 and the human protein ZAKI-4 , including a preserved region that is supposedly a phosphatase substrate (a serine-proline rich motif), another one assumed to be a calcineurin docking site, and an SH3 ligand domain, involved in protein dimerization [4, 8]. ZAKI-4 is a protein whose expression is positively activated by the thyroidal hormone triiodothyronine (T3); however, induction with T3 failed to produce any significant increase in the expression of DSCR1 [6, 8, 11]. Because the human proteins DSCR1 and ZAKI-4 are capable of binding and inhibiting calcineurin signaling in myocytes, they were grouped as members of a new family of proteins called Myocyte-Enriched Calcineurin Interacting Protein . A new protein dubbed DSCR1L2, whose gene is located in chromosome 1 and which also presents a high identity with DSCR1 and ZAKI-4, has also been included in this family . Calcineurin, also known as protein phosphatase 2B (PP2B), mediates many cellular responses signalized by calcium, including the activation of lymphocytes, neurons and muscular development, which could be prevented by the addition of immunosuppressive drugs or overexpression of endogenous inhibitor proteins, as DSCR1 [13–15]. A novel calcineurin-binding protein, called CBP1, from the pathogenic fungus Cryptococcus neoformans was recently identified. This protein presents a serine-proline rich motif identical to DSCR1 and to other calcineurin-inhibiting proteins and is detected in fungi to humans. Electrophoretic mobility experiments and mutations involving the serines have shown that CBP1 can be a phosphoprotein, a substrate of calcineurin and/or of calcium-calmodulin complex-dependent kinases . Calcineurin, which is activated by calcium-calmodulin signaling, regulates the nuclear import of NF-AT (Nuclear Factor Activated T Cells) by dephosphorylation of specific serines, promoting translocation of NF-AT to the nucleus where, in a complex with AP1, it activates the transcription of specific genes such as IL2 . It was recently discovered that the last 82 amino acid residues in the carboxi-terminal of DSCR1 inhibit the calcineurin signal, preventing the translocation of NF-AT to the nucleus, even when calcineurin activity is induced by ionophore and phorbol ester . Moreover, the DSCR1 promoter region presents a binding sequence for the NF-AT transcription factor, indicating that DSCR1 participates in a negative feedback-type regulation process mediated by calcineurin itself [6, 18]. In this study, we investigated the intracellular location of DSCR1 in different cell lines and, by means of specific mutations, we detected some possible signaling regions within the DSCR1. Thus, we identified domains and amino acids that are prone to phosphorylation/dephosphorylation events that influence the protein's siting and that may be associated with the function of the protein, which, in turn, could be a candidate for involvement in DS pathogenesis. The DSCR1 location was detected by an analysis of the expression of the pEGFP-DSCR1 or pDSCR1-EGFP plasmids in CHO-1, COS-7 and HEK 293 cells. The three different DSCR1 isoforms were detected in the nucleus of the analyzed cells, with only slight signaling in the cytoplasm, thus confirming their predominantly nuclear location. Exemplary results for the third isoform are presented here (Figs. 1,2). The other isoforms showed analogous patterns (data not shown). The EGFP (control) displayed a homogeneous distribution pattern in the cells analyzed. Confocal laser scanning microscope images of both DSCR1 and DSCR1-mutant expression in CHO-1 (line 1, A-D), COS-7 (line 2, E-H) and HEK 293 cells (line 3, I-L). Subcellular location of: EGFP (A, E, I), DSCR1 (pEGFP-DSCR1)(B, F, J), DSCR11–137 (C, G, K) and DSCR1138–171 (D, H, L). The different mutational constructions are included in the section on material and methods and analyzed in detail in the results section. Scale bars are indicated in the figure. In an attempt to identify the region responsible for nuclear targeting, expression vectors were constructed to originate truncated forms of the third DSCR1 isoform fused with the GFP (Fig. 1). The absence of the last 33 amino acids altered the intracellular distribution of the DSCR1 and a cytoplasmic accumulation was detected, indicating that this region possibly contains a nuclear location signal (Fig. 2). Sequences that were described in these 33 residues include a putative SH2 ligand domain and a calcineurin docking site. 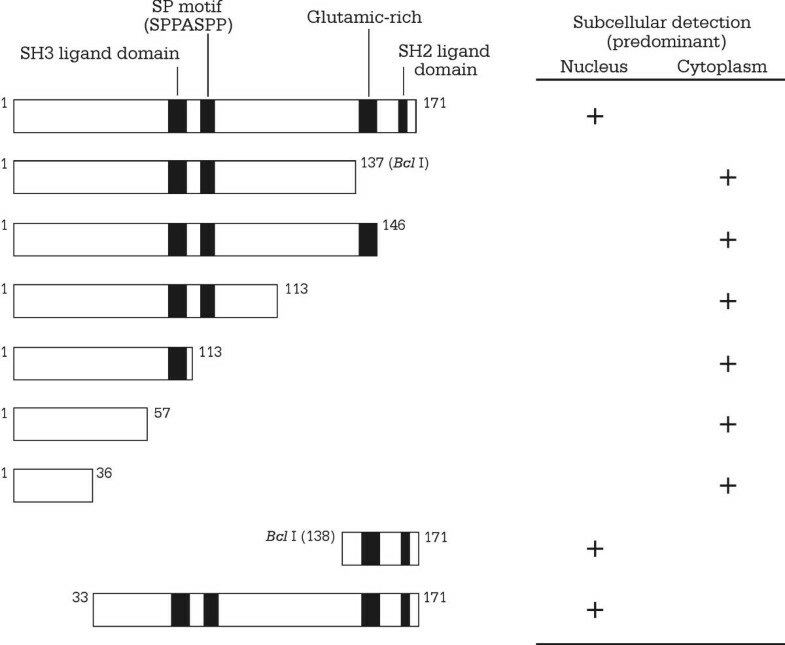 Analyses of location involving point mutations by replacement of threonines for alanines within these described regions (PEYT166PI and PKIIQT160) revealed a cytoplasmic distribution pattern of the third DSCR1 isoform with an accumulation of the protein in the form of granules (Fig. 3). Confocal laser scanning microscope images of distinct DSCR1-punctual mutants expression in CHO-1 (line 1, A-D), COS-7 (line 2, E-H) and HEK 293 cells (line 3, I-L). Subcellular location of: DSCR1A160 (A, E, I), DSCR1A166 (B, F, J), DSCR1A160+A166 (C, G, K) and DSCR1A108+A112 (D, H, L). The different constructions obtained by site-directed mutagenesis are included in the section on material and methods and analyzed in detail in the results section. Scale bars are indicated in the figure. Mutated sequences are shown at the bottom (dots indicate the amino acids replaced by alanines). We also investigated whether the serines of the SPPASPP motif of the fourth DSCR1 isoform (also present in the others) could be involved in its distribution in the cell. 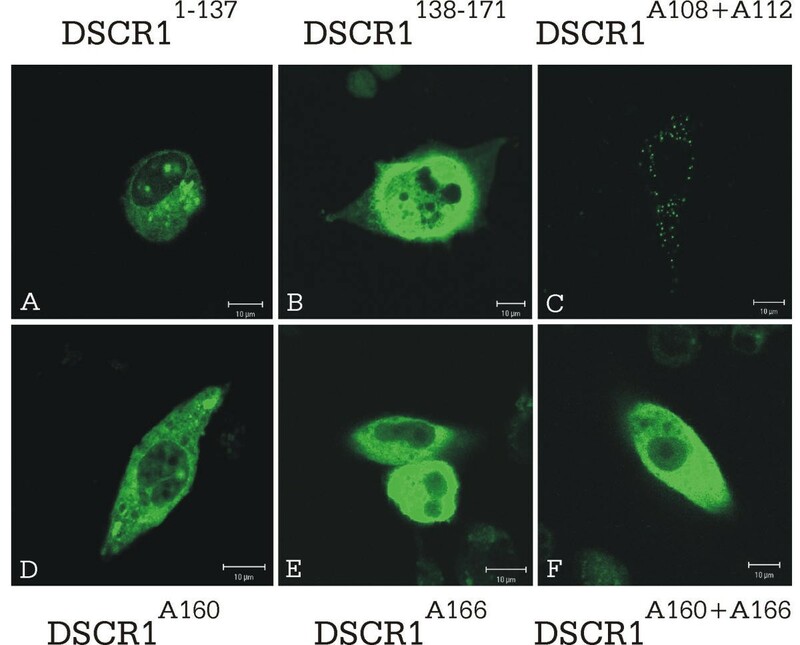 Point mutations involving substitution of serines by alanines (DSCR1A108+A112) prevented the DSCR1 from entering the nucleus and originated a distribution pattern in the shape of small granules in the cellular cytoplasm (Fig. 3). Both CHO-1 cells expressing DSCR1 mutated-forms subjected to PMA/Ionomycin and/or Cyclosporin A and nontreated cells displayed the same subcellular location pattern (Fig. 4). In addition, small granules in the cytoplasm were detected in some DSCR1-mutated forms when they were compared with nontreated cell location patterns. Confocal laser scanning microscope images of DSCR1-mutated forms after the addition of PMA/Ionomycin and/or Cyclosporin A. Subcellular location of: DSCR11–137 (A), DSCR1138–171 (B), DSCR1A108+A112 (C), DSCR1A160 (D), DSCR1A166 (E) and DSCR1A160+A166 (F). Treatments with PMA/Ionomycin and Cyclosporin A did not influence the subcellular location patterns. Scale bars are indicated in the figure. Previous studies on the subcellular location of the DSCR1 protein have been carried out in C2C12 mouse myoblast cell line, in which the protein was detected in the nucleus ; thus, our analyses corroborate that finding. Our experiments using fusions of DSCR1 with the green fluorescent protein detected the fusion protein preferentially in the nucleus of the analyzed cells. The detection was not altered by the insertion of DSCR1 in the GFP's N- or C-terminal, thus precluding any kind of artifact. The location was also independent of the cell line used and no differences were found for any of the isoforms. Having analyzed the location of the DSCR1, our next step was to determine the regions responsible for the protein's location. To this end, we built truncated forms of the DSCR1, removing regions of the C- and the N-terminal. Using the pEGFP-DSCR1Δ138–171 construction, we found that the absence of the last 33 amino acids in the carboxi-terminal altered the DSCR1's intracellular distribution, which was now detected preferentially in the cytoplasm of the analyzed cells. This finding was complemented by an analysis of cells transfected with the pEGFP-DSCR1Δ1–137 plasmid, whose GFP is fused only with the 33 amino acids. An accumulation of the fusion protein in the nucleus was detected in the cells transfected by this construction. Hence, this region containing the 33 amino acids in the C-terminal is required for nuclear location, suggesting that it may act or contribute with a nuclear location signal (NLS). However, it is important to clarify that we used the third isoform for deletion studies because it was the first form described and we are of the opinion that it does not differ from the other forms insofar as subcellular location is concerned. The DSCR1 possesses a putative NLS in the 33 C-terminal amino acids (RRPKPK). However, point mutations of arginines into alanines in the RRPKPK motif did not prevent the protein's migration to the nucleus (data not shown), suggesting that this domain either does not constitute a NLS or that the mutations into alanines were insufficient for its inactivation. By means of site-directed mutagenesis, we identified amino acids that are supposedly a target of phosphorylation/dephosphorylation events and that are important for the perfect location of DSCR1. A simple substitution of a residue of threonine (DSCR1A166) for alanine resulted in cytoplasmic accumulation of the DSCR1. This amino acid is contained in a probable SH2 ligand domain , identified in the last 33 amino acids of the protein. Based on these results, we hypothesize that the nuclear accumulation of DSCR1 can be controlled at two levels: phosphorylation within a probable NLS and/or formation of a heterodimer with a specific protein. SH2 domains participate in protein dimerization processes and can recognize phosphorylated residues close to the tyrosine of the SH2 ligand domain [21, 22]. Hence, the threonine residue in the supposed SH2 ligand domain of the DSCR1, possibly phosphorylated, may be important for its recognition, which is assumed to be involved in controlling the protein's translocation to the nucleus. It was recently discovered that DSCR1 interacts physically and inhibits calcineurin signaling [6–9, 11–13]. Two specific regions within the DSCR1 interact with calcineurin: a serine-proline rich region and a region close to the carboxi-terminal, called "calcineurin docking site" . By point mutations in the probable calcineurin docking site (PKIIQT), another putative signaling amino acid (threonine) was identified, whose substitution by alanine provoked a cytoplasmic accumulation of DSCR1. In addition, mutants DSCR1A160 and DSCR1A166 showed an accumulation of the protein in the form of granules, suggesting its possible association with other proteins or specific structures, even of the cellular cytoskeleton. The serine-proline rich motif of DSCR1 is highly conserved and found from fungi to humans, acting as a substrate of calcineurin [7, 8, 12, 16, 18, 23]. Calcineurin acts in the dephosphorylation of the serines inside the serine-proline motif in the several proteins in which it is present, differing in the number of repetitions, with three found in NF-AT and two in DSCR1 [8, 24, 25]. Acting in this region, as described for CBP1 , kinases and phosphatases may be present, forming a complex. The nuclear location of the E2F transcription factor is dependent on the formation of a heterodimer , which is regulated by phosphorylation of the two serine residues that facilitate protein-protein interaction . The mutant DSCR1A108+A112, in which the serine residues of the serine-proline rich motif were substituted for alanines, showed preferential cytoplasmic location in the form of small points dispersed throughout the cytoplasm. This location pattern may even be related to the accumulation of DSCR1 in the cellular cytoskeleton, as described for protein 1B associated with microtubules , or to mitochondria since, in the hamster DSCR1 ortholog isoform adapt78, isolated from a Chinese hamster fibroblast culture induced by oxidative stress, a probable target signal region for mitochondria was described in the N-terminal . An analysis by co-visualization of this mutant form, together with a fluorescent red reporter protein carrying a target sequence for mitochondria, failed to reveal superimposition of the distribution patterns of the two proteins (data not shown). 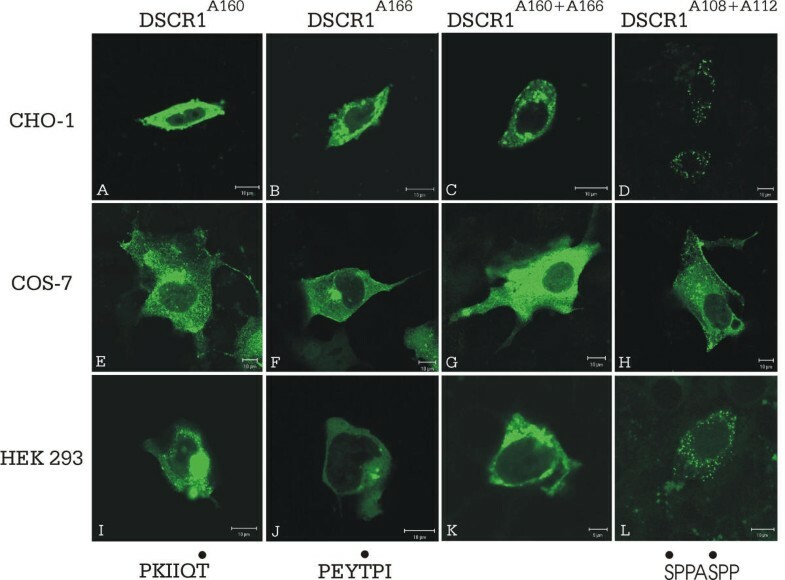 Be that as it may, it seems clear that the serines found in the SPPASPP motif, which may be targets of phosphorylation/dephosphorylation events, are important for the nuclear location and cellular activity of the DSCR1. Recently, it was confirmed that the DSCR1 can be phosphorylated by mitogen-activated protein kinase (MAPK) and glycogen synthase kinase-3 (GSK-3), forming a substrate to calcineurin. Moreover, a specific serine residue within the conserved SP repeat domain was phosphorylated by GSK-3 and dephosphorylated by calcineurin in vitro . In addition, we carried out treatments with PMA/Ionomycin, which activate calcium signaling and, inversely, with Cyclosporin A, an immunosuppressor that blocks the interaction of calcineurin with other proteins. These treatments failed to change the location of the mutants described herein, confirming that the eliminated or substituted amino acids effectively participate in a specific signal and are independent of these treatments. By means of mutational analyses, therefore, our studies identified amino acids that participate in the location of the DSCR1 and that are probably responsible for a specific cellular response. DSCR1 can represent a phosphoprotein in which the state of phosphorylation is essential for a given location pattern and consequent activity. DSCR1 has been demonstrated previously to be a nuclear protein. In the work reported on herein, this finding has been confirmed in different cell lines. Furthermore, we have demonstrated the importance of the 33 C-terminal amino acids in this location. Besides, punctual mutations in amino acids that are prone to events of phosphorylation/dephosphorylation altered the DSCR1 location, suggesting that its subcellular location and activity may be regulated by kinases and/or phosphatases. The open reading frames of human DSCR1 (Genbank accession numbers U85266, U28833 and U85267) were amplified by polymerase chain reaction  containing fetal brain cDNA library (Gibco BRL) as template. Specific forward primers, i.e., 5'-gAA gAT CTA Tgg Agg Tgg AC-3' or 5'-gAA gAT CTA Tgg Tgt ATg CCA AA-3' or 5'-gAA gAT CTA TgC ATT TTA gAA AC-3', were used to amplify, respectively, the first (exons 1,5,6,7), third (exons 3,5,6,7) and fourth (exons 4,5,6,7) DSCR1 isoforms, according to the nomenclature proposed in . A single reverse primer, 5'-TCA gCT gAg gTg gAT cgg cgt-3', was used to amplify all the isoforms. The amplified products with approximately six hundred base pairs were cleaned using the Concert PCR Purification System (Invitrogen-Life Technologies), cut with Bgl II and cloned in pEGFP-C1 and pEGFP-N1 (Clontech Lab.) cut with Bgl II and Sma I. The stop codon on reverse primer was eliminated for pEGFP-N1 constructions. C-terminal deletions of DSCR1 (using the third isoform) were also carried out under standard PCR conditions  using distinct reverse primers that deleted the amino acids indicated (DSCR1Δ148–171, DSCR1Δ113–171, DSCR1Δ81–171, DSCR1Δ57–171, DSCR1Δ36–171). A single forward primer, which amplified the third isoform, was also included in each amplification of DSCR1-mutants (with Bgl II restriction site to facilitate the cloning into pEGFP-C1). This isoform was used because the C-terminal of DSCR1 is identical for all the isoforms and because it presents an indistinct location pattern in comparison to the others. In addition, all the domains involved in calcineurin binding are present in this isoform. One N-terminal deletion (DSCR1Δ1–33) and two fragments (DSCR1Δ138–171, DSCR1Δ1–137) generated with Bcl I restriction enzyme (Invitrogen) were also included in this analysis. Replacement of the threonine amino acids by alanine residues (DSCR1A160, DSCR1A166 and DSCR1A160+A166) was done by PCR, using primers incorporating the desired base substitutions in the third DSCR1 isoform. Replacement of the serine residues by alanines in the SP motif (DSCR1A108+A112) was done similarly, but using the fourth isoform. All the DSCR1-mutated forms were cloned in pEGFP-C1. Details of PCR conditions and sequence primers are available upon request. All the constructions were sequenced with a Big Dye Terminator Cycle Sequence-ready Reaction kit and analyzed in an automatic DNA sequence analyzer ABI-PRISM 377 (Applied Biosystems). CHO-1 (Chinese Hamster Ovary), COS-7 (SV-40 African Green Monkey Kidney) and HEK 293 (Human Embryonic Kidney) cells were cultured in Dulbecco's modified Eagle's medium (DMEM) containing 10% fetal bovine serum, penicillin (100 U/ml) and streptomycin (100 μg/ml) in a humidified atmosphere of 5% CO2. Cells were plated 12–24 h prior to transfection on a 35 mm tissue culture dish at 5 × 104–105 cell/dish, containing a coverslip coated with 0.1% gelatin. The cells were transfected with Lipofectamine™ 2000 (Invitrogen) and were harvested 24–48 h after transfection. The cell cultures (CHO-1) were also subjected to treatments with PMA/Ionomycin and Cyclosporin A (Calbiochem, CN Corp.), as described in reference . Inverted microscopy was performed using a Zeiss LSM510 Laser-Scanning Microscope. The images were captured using 20 × 0.5, 40 × 1.2 and 63 × 1.4 numerical aperture objective lenses, at 488 nm (λexc.) and 509 nm (λem. ), corresponding to an argon ion laser with a pinhole of 73 to 103 μm. All the images were color scanned. The authors thank Renata Manelli-Oliveira and Roberto Cabado (ICB, USP, Brazil) for performing the confocal microscopy analyses and César Sommer (DGE-UFSCar) for his suggestions and help in revising this manuscript. We are also indebted to the Brazilian research funding institution FAPESP for its grant and financial support for publication (Process #96/11018-0 and #98/00645-0).